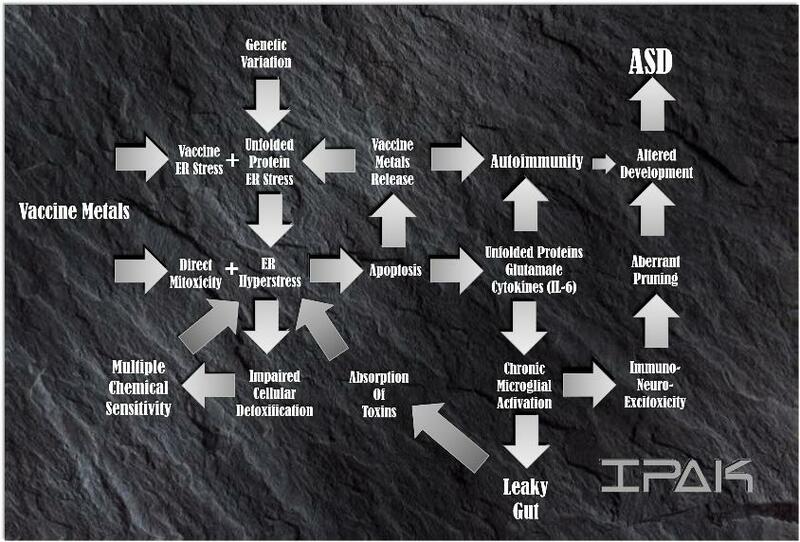 After reviewing thousands of studies over two years, a more complete picture of the causality of ASD has now emerged. We are working on an interactive web resource to allow the public and researchers to access the scientific literature in support of each component of this ASD causality model. Note that this model includes an important component of genetic susceptibility, never addressed in whole-population ecological correlational association studies. Again, the hypothesis of genetic susceptibility has not been addressed. USAGE: Please use with citation and reference "Personal Communication, Dr. J. Lyons-Weiler, The Institute for Pure and Applied Knowledge" with a link to this webpage. You can support independent research with a small monthly donation. You can also support IPAK with a one-time "Thank you" donation. Aremu DA, Ezomo OF, Meshitsuka S. Gene expression in primary cultured astrocytes affected by aluminum: alteration of chaperons involved in protein folding. Environ Health Prev Med. 2011;16:16-24. Franchi L, Núñez G. The Nlrp3 inflammasome is critical for aluminium hydroxide-mediated IL-1beta secretion but dispensable for adjuvant activity. Eur J Immunol. 38(8):2085-9. Rizvi SH, Parveen A, Ahmad I, Ahmad I, Verma AK, Arshad M, Mahdi AA. Aluminum Activates PERK-EIF2α Signaling and Inflammatory Proteins in Human Neuroblastoma SH-SY5Y Cells. Biol Trace Elem Res. 2016;172(1):108-19. Rizvi MSH, Parveen A, Verma AK, Ahmad I, Arshad M, Mahdi AA. Aluminium induced endoplasmic reticulum stress mediated cell death in SH-SY5Y neuroblastoma cell line is independent of p53. PLoS One. 2014;30;9(5):e98409. Stamogiannos A, Papakyriakou A, Mauvais FX, van Endert P, Stratikos E. Screening Identifies Thimerosal as a Selective Inhibitor of Endoplasmic Reticulum Aminopeptidase 1. ACS Med Chem Lett. 2016;7:681-5. Sharpe, MA et al., 2012. Thimerosal-Derived Ethylmercury Is a Mitochondrial Toxin in Human Astrocytes: Possible Role of Fenton Chemistry in the Oxidation and Breakage of mtDNA Journal of Toxicology Volume 2012 Article ID 373678, 12 pages. De Chambrun G.P., Body-Malapel M., Frey-Wagner I., Djouina M., Deknuydt F., Atrott K., Vignal C. Aluminum enhances inflammation and decreases mucosal healing in experimental colitis in mice. Mucosal Immunol. 2014;7:589–601. Kirschbaum, BB and C Schoolwerth. 1989. Acute Aluminum Toxicity Associated with Oral Citrate and Aluminum-Containing Antacids. The American Journal of the Medical Science 297:9-11. Yu L 2016. Potential of Lactobacillus plantarum CCFM639 in Protecting against Aluminum Toxicity Mediated by Intestinal Barrier Function and Oxidative Stress. Nutrients. 8:pii: E783. Yu, L 2017. Lactobacillus plantarum CCFM639 can prevent aluminium-induced neural injuries and abnormal behaviour in mice. Journal of Functional Foods 30:142-150. Yu, L. 2017. Dietary Lactobacillus plantarum supplementation enhances growth performance and alleviates aluminum toxicity in tilapia Ecotoxicology and Environmental Safety 143:307-314. Grubišić V and Parpura V. 2015. The second brain in autism spectrum disorder: could connexin 43 expressed in enteric glial cells play a role? Front Cell Neurosci. 9:242. doi: 10.3389/fncel.2015.00242. Kirchgessner AL et al., 1997. Excitotoxicity in the enteric nervous system. J Neurosci. 17(22):8804-16. Garaud JC, Schickel JN, Blaison G et al. B cell signature during inactive systemic lupus is heterogeneous: toward a biological dissection of lupus. PLoS One 2011;6:e23900. Clavarino G, Adriouach S, Quesada JL, Clay M et al. Unfolded protein response gene GADD34 is overexpressed in rheumatoid arthritis and related to the presence of circulating anti-citrullinated protein antibodies. 2016;49(3):172-8. Strunecka A., et al. 2018. Immunoexcitotoxicity as the central mechanism of etiopathology and treatment of autism spectrum disorders: A possible role of fluoride and aluminum. Surg Neurol Int. 2018; 9:74. Thomas MS. The over-pruning hypothesis of autism. Dev Sci. 2016 19(2):284-305. Kim HJ et al. Deficient autophagy in microglia impairs synaptic pruning and causes social behavioral defects. Mol Psychiatry. 2017 22(11):1576-1584. Tomljenovic L, Shaw CA Mechanisms of aluminum adjuvant toxicity and autoimmunity in pediatric populations. Lupus. 2012 21(2):223-30. Malkki H. Neurodevelopmental disorders: Maternal antibodies induce autism-like phenotype in mice. Nat Rev Neurol. 2016 12:678-679. doi: 10.1038/nrneurol.2016.165. Have a study to recommend? Email us!